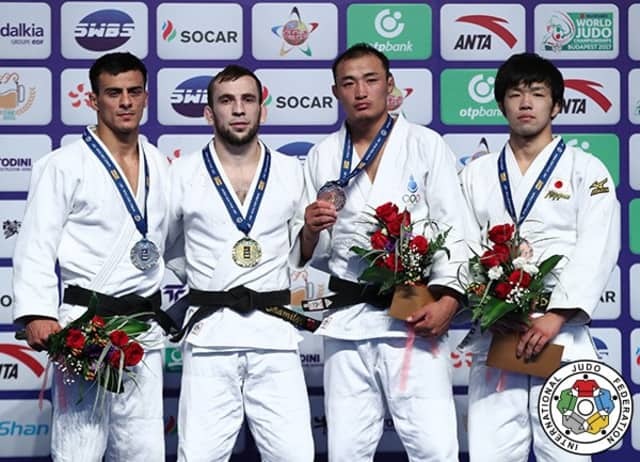 The Hohhot Grand Prix, the final IJF World Judo Tour event before the 2017 Suzuki World Judo Championships in August, crowned five gold medallists on day one as the lightweights took centre stage in China. 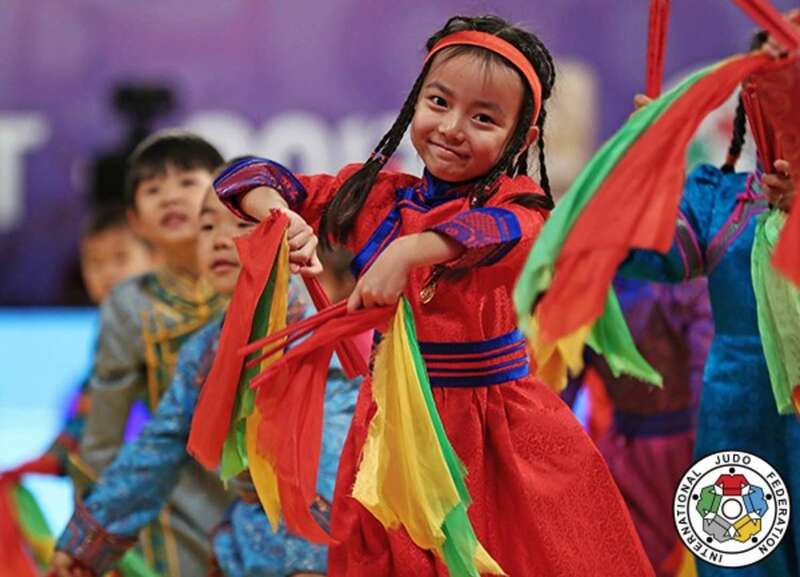 The new location for China’s annual leg of the IJF World Judo Tour has embraced the world stage and 225 judoka from 26 nations as Inner Mongolia – already a key territory for judo in the country – is poised to initiate a surge in popularity for the sport. Following Grand Prix events in Dusseldorf (GER), Tbilisi (GEO), Antalya (TUR), Cancun (MEX) and Grand Slam events in Paris (FRA), Baku (AZE) and Ekaterinburg (RUS) the compelling 2017 season is on the verge of arriving in Budapest, Hungary for the first World Championships since 2015. The Worlds, which have been held annually since 2009, are not held in an Olympic year and so the anticipation and excitement surrounding the seven-day judo festival has reached an all-time high with the sport attracting new fans and more worldwide coverage with simplified rules and more dynamic judo. The five gold medals at stake on day one in Hohhot were won by table-topping Japan (2), Russia, the Democratic People’s Republic of Korea and the Republic of Korea. A host of judo’s most distinguished champions are now members of the IJF team and work on various commissions for the day-to-day development of the sport at the elite level with a focus on the IJF World Judo Tour. 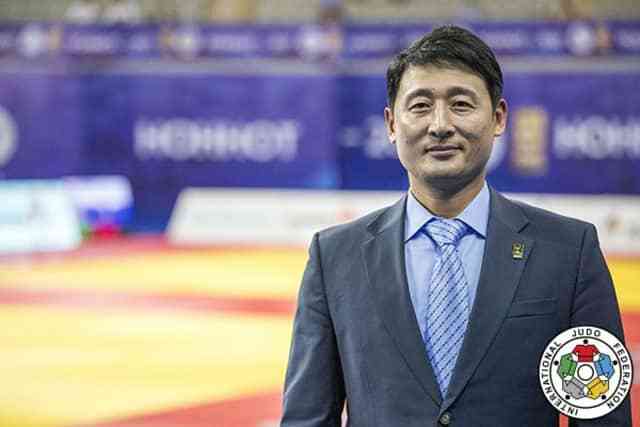 IJF Hall of Famer KI-YOUNG Jeon (KOR) is one of judo’s most celebrated judoka. The Atlanta 1996 Olympic champion, who is now an IJF Sports Director, cast his mind back to his early days in the sport and when he first harboured the ambitions of one day becoming a world champion. “I started judo when I was 12 years old and when I was 16 I won the national championships in middle school. Then it was my dream to win the World Championships, I really felt that I could achieve it. KI-YOUNG went to the World Championships for the first time in 1993 at the age of 20. The South Korean met his future long-term rival and 1992 Olympic champion YOSHIDA Hidehiko (JPN) in the final and won in a stunning victory. “I felt very relaxed when I fought at the World Championships for the first time,” said KI-YOUNG. KI-YOUNG went on to win the Worlds in 1995 and 1997 and retired undefeated at the World Championships with three gold medals from three appearances at judo’s annual supershow. Looking ahead to Budapest 2017, KI-YOUNG has high expectations. “This year marks the start of a new cycle with a modified set of rules and new judoka competing at the World Championships for the first time. We are seeing a new pace to the contests with an improved set of rules and our sport is continuing to develop to attract new fans. 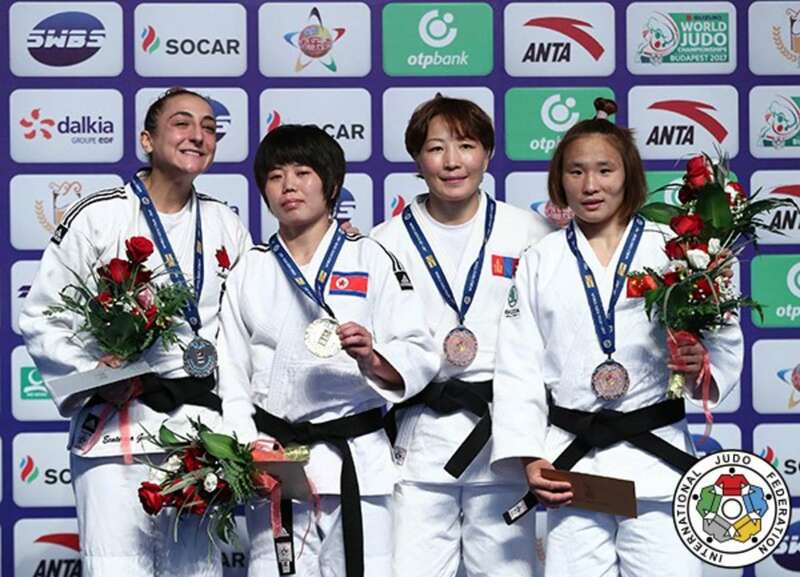 Asian Championships bronze medallist KANG Yu-Jeong (KOR) won her first Grand Prix gold medal as her country’s new batch of judoka made a promising start in Hohhot. 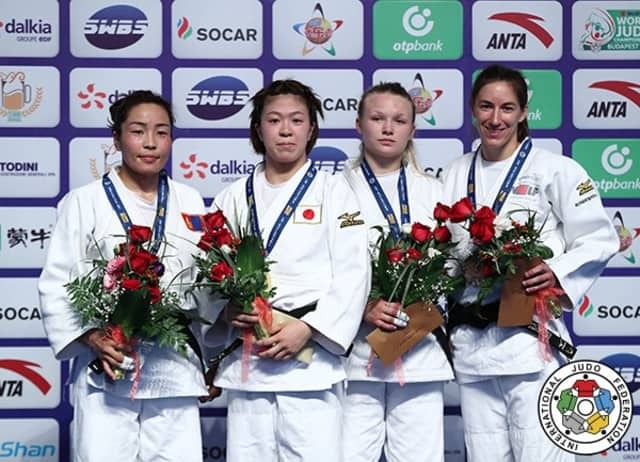 Former Ulaanbaatar Grand Prix silver medallist KANG defeated European Championships silver medallist Irina DOLGOVA (RUS) in the first final of the competition. 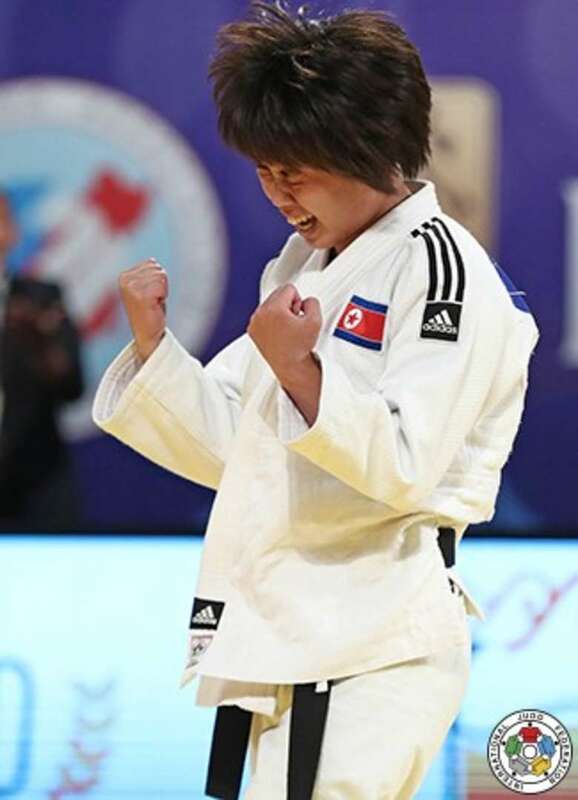 With five seconds remaining the South Korean scored a waza-ari with a yoko-sutemi-waza movement and jumped into the arms of her coach to celebrate after being awarded the contest. 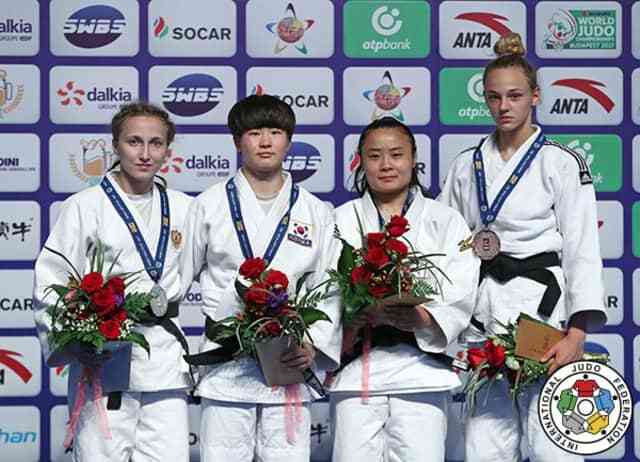 In the first semi-final World Judo Masters bronze medallist Maryna CHERNIAK was edged out by KANG by a waza-ari. The second semi-final saw DOLGOVA throw Bucharest European Open silver medallist Francesca MILANI (ITA) in added time for a waza-ari and a spot in the final. The first bronze medal contest was won by world number 132 JIANG Yahong (CHN) against the shot-shy MILANI. The Italian was fighting for an IJF medal for the first time and failed on this occasion as she received her third shido in golden score and was disqualified to hand the first medal of the competition to the home judoka. The second bronze medal was won by European champion Daria BILODID (UKR) who showered her character to come back from defeat to win a place on her first IJF World Judo Tour podium. Teenage star BILODID, the daughter of former world bronze medallist Gennady BILODID (URK), faced the top seed and her compatriot in an IJF setting for the first time and came out on top by holding CHERNIAK down with a sankaku-gatame for 20 seconds and ippon. 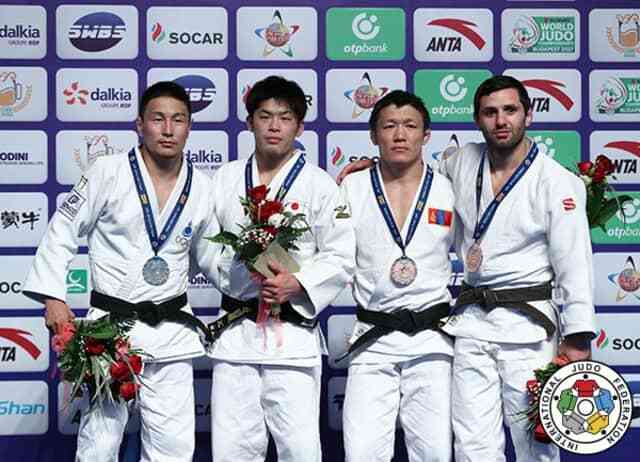 In the first semi-final RIM bested Asian Championships silver medallist CHINTOGTOKH Azzaya (MGL) by a waza-ari score. In the second semi-final GUICA inflicted defeat on former world champion MUNKHBAT Urantsetseg (MGL) who was held down for 20 seconds with a sankaku-gatame. The first bronze medal was clinched by MUNKHBAT who blocked the medal bid of IJF world Judo Tour debutant WANG Jueyao (CHN). Mongolia’s MUNKHBAT, who will return to -48kg duty at the World Championships, had a ude-garami locked on during a transition and WANG submitted. The second bronze medal was won by 21-year-old Asian Championships bronze medallist WANG Xin (CHN) who defeated Mongolian opposition in CHINTOGTOKH. WANG found a way past former Ulaanbaatar Grand Prix silver medallist CHINTOGTOKH after 74 seconds of golden score from a foot sweep which the latter never saw coming. Tokyo Grand Slam bronze medallist TAMAOKI Momo (JPN) made the most of her first IJF competition in 2017 as she won all five of her contests in Hohhot to come away with gold. The -57kg category is one of Japan’s deepest with world number one YOSHIDA Tsukasa (JPN) the gold medal favourite for Budapest and so every competition counts for TAMAOKI and she not did disappoint today. 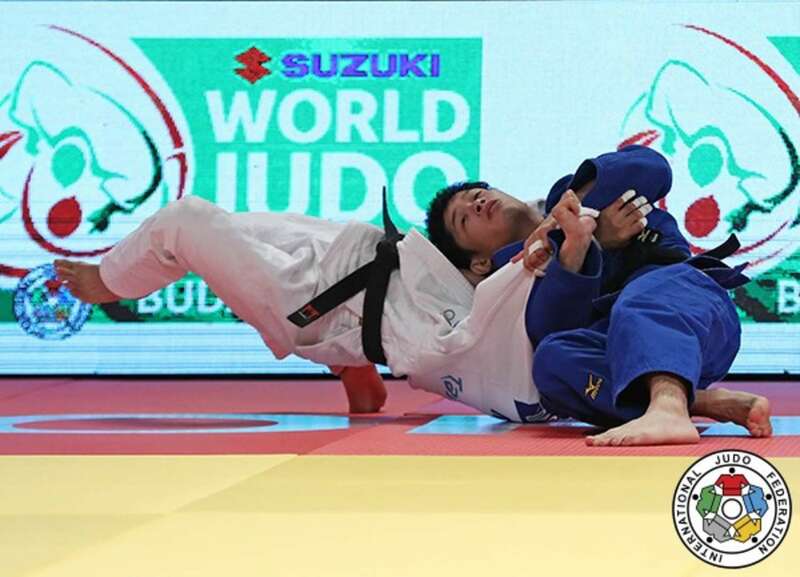 Rio 2016 Olympic silver medallist DORJSUREN Sumiya (MGL) fell behind to a waza-ari from a driving ouchi-gari and looked to be slipping to defeat before rescuing the contest with a waza-ari with three seconds left to tie up the scores. Four further minutes of action were required as five-time Grand Prix winner DORJSUREN received her third and final shido for passivity and was disqualified as Japan won their second gold medal on day one. 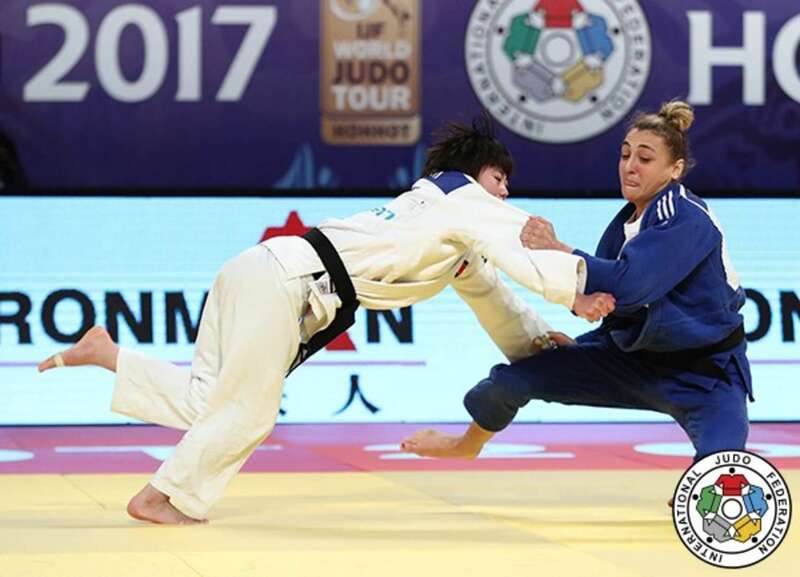 In the first semi-final DORJSUREN defeated three-time Grand Slam bronze medallist Viola WAECHTER (GER) in golden score with a drop morote-seoi-nage in a spectacular conclusion to an exciting contest. In the second semi-final TAMAOKI conquered Ekaterinburg Grand Slam bronze medallist Jessica KLIMKAIT (CAN) with an osoto-gari in golden score. The first bronze medal was won by KLIMKAIT after world number 94 RI Hyo Sun (PRK) - who last graced the IJF circuit in 2015 – received a shido in golden score. The second bronze medal was won by WAECHTER who gave her country a 100% medal-winning record in Hohhot by beating Tbilisi Grand Prix bronze medallist Margriet BERGSTRA (NED). WAECHTER, the only German judoka in China, threw beautifully with an uchi-mata after just 12 seconds for ippon and will expect to make her next appearance on the circuit at the Worlds in August. Former Paris Grand Slam winner SHISHIME Toru (JPN) struck in the men’s lightest weight category as he won his third Grand Prix title. Baku Grand Slam winner SHISHIME, 25, is ninth in the world but has two Japanese judokla in front of him with TAKATO Naohisa (JPN) second in the world and NAGAYAMA Ryuju (JPN) sixth with the latter duo both receiving the nod for Budapest. 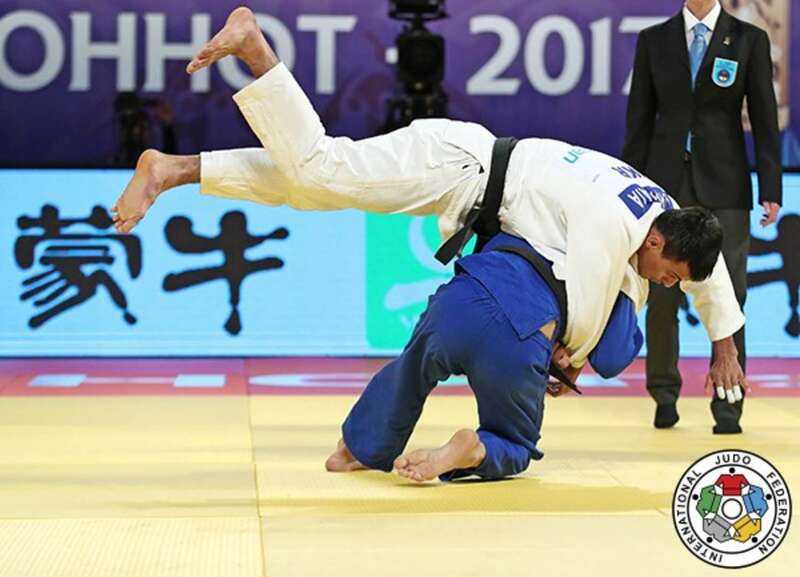 SHISHIME defeated world number eight DASHDAVAA Amartuvshin (MGL) by ippon with a piece of ashi-waza to remain a dependable choice for his country and earn future selections in the second half of the year. The Japanese judoka led by a waza-ari from a yoko-otoshi and added the finishing touches by ippon and can be expected to reappear at the Tokyo Grand Slam in December if not before. In the first semi-final DASHDAVAA saw off European champion Robert MSHVIDOBADZE (RUS) by a waza-ari after 31 seconds of golden score. In the second semi-final SHISHIME downed Ekaterinburg Grand Slam bronze medallist Albert OGUZOV with a clinical display. The Japanese judoka scored two waza-ari without reply as he made good on his attacking threats to advance into the final. The first bronze medal was won by former world champion GANBAT Boldbaatar (MGL) who surpassed OGUZOV by a waza-ari score from a yoko-otoshi. The Mongolian’s form has been indifferent since he won the Worlds in 2014 but has now surely done enough for selection to judo’s annual showpiece in August while OGUZOV will be highly-disappointed with his fifth-place and may miss out on a date in Hungary. 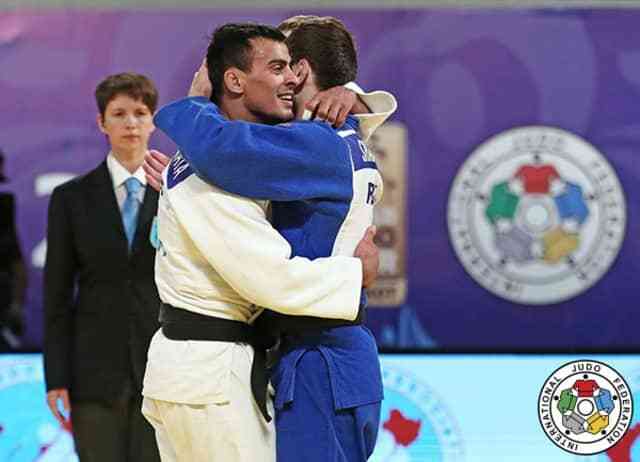 The second bronze medal was won by MSHVIDOBADZE who defeated Asian Championships silver medallist Mohammad RASHNONEZHAD (IRI) to stake his claim for Worlds selection. Russia have a glut of riches in every weight category and MSHVIDOBADZE had to medal here to maintain his bid while RASHNONEZHAD is the latest name from Iran who is making an impression at this level. Abu Dhabi Grand Slam winner Yakub SHAMILOV (RUS) won the Chinese Grand Prix for the second time in his career with a marginal win over 2009 world champion and 2017 European Championships winner Georgii ZANTARAIA (UKR). The 29-year-old won his last IJF medal in 2015 (Abu Dhabi Grand Slam bronze) but is a master of evasion, innovation and an all-round magical talent for the world for marvel. Ukrainian hero ZANTARAIA now has a rhythm at -66kg and will be a major contender in Budapest despite starting without a seeded position but it still remains to be seen if Russian winner SHAMILOV, who won gold in China in 2014, receives the call-up in August. 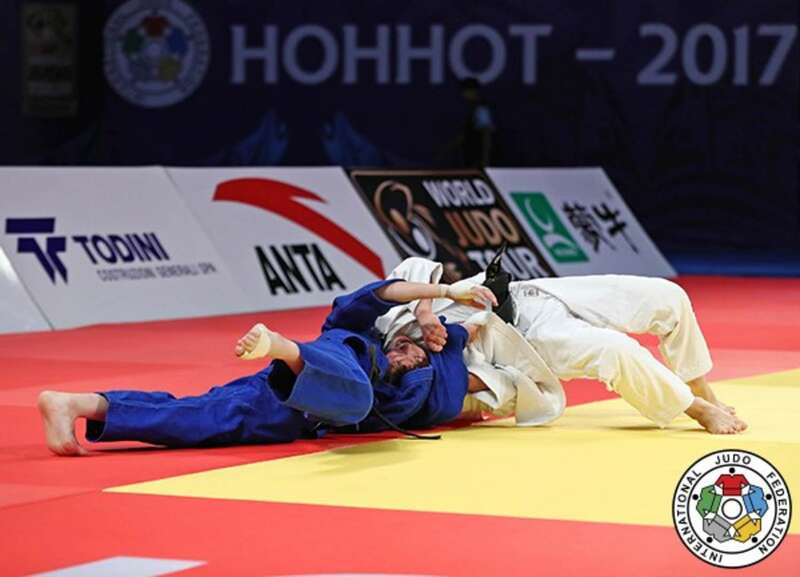 In the first semi-final ZANTARAIA saw off Tokyo Grand Slam bronze medallist DOVDON Altansukh (MGL) in golden score. A single shido was the difference as the Mongolian was penalised in added time to send the Ukrainian into the final. In the second semi-final SHAMILOV narrowly defeated 23-year-old Grand Prix newcomer YONDONPERENLEI Baskhuu (MGL) by two waza-ari after a high-energy contest. The first bronze medal was won by YONDONPERENLEI with a buzzer-beating score against former World Judo Masters bronze medallist TAKAICHI Kengo (JPN). The 23-year-old had a fine run during the preliminaries and made a medal-winning start to his Grand Prix career as TAKAICHI struggled to get to grips with the unorthodox Mongolian fighting style of YONDONPERENLEI. A pick up with one second left turned TAKAICHI over for a waza-ari score which went down well with the supporters in the stands as Mongolia imposed themselves further on day one. The second bronze medal went to Tokyo Grand Slam silver medallist HASHIGUCHI Yuuki (JPN) who was at his explosive best against DOVDON as Japan came out on top against Mongolia this time around. HASHIGUCHI opened the scoring with a waza-ari from a sode-tsurikomi-goshi before throwing with a seoi-nage that lifted DOVDON up into the rafters before he turned out enough to only give away a waza-ari instead of the maximum score. The Mongolian battled away and almost got a juji-gatame at one point but his Japanese adversary was the stronger judoka and earned his place on the podium.